Zhuge Liang, Wade-Giles romanization Chu-ko Liang, courtesy name Kongming (born 181, Yangdu [now Yinan, Shandong province], China—died August 234, Wuzhangyuan [now in Shaanxi province], China), celebrated adviser to Liu Bei, founder of the Shu-Han dynasty (221–263/264). Zhuge, to whom supernatural powers often are ascribed, has been a favoured character of many Chinese plays and stories. Legend states that Liu Bei, then a minor military figure, heard of Zhuge Liang’s great wisdom and came three times to the wilderness retreat to which Zhuge had retired to seek him out as an adviser. It is known that Zhuge helped Liu organize a large army and found a dynasty. Liu was so impressed with Zhuge’s wisdom that on his deathbed Liu urged his son to depend on Zhuge’s advice and urged Zhuge to ascend the throne himself if the prince were unable to rule. A mechanical and mathematical genius, Zhuge is credited with inventing a bow for shooting several arrows at once and with perfecting the Eight Dispositions, a series of military tactics. In the Sanguozhi yanyi (Romance of the Three Kingdoms), the great 14th-century historical novel, Zhuge is one of the main characters; he is portrayed as being able to control the wind and foretell the future. 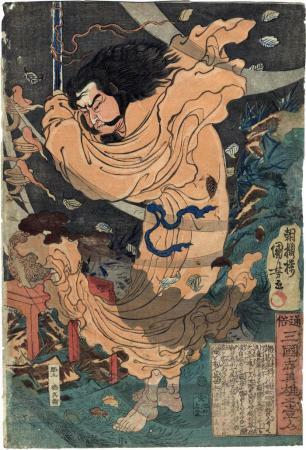 Illustrated with a very small image in color in Samurai Stars of the Stage and Beautiful Women: Kunisada and Kuniyoshi, Masters of the Color Woodblock Print by Hatje Cantz, Museum Kunstpalast, p. 270, #168. Cantz wrote: "Komei (Chinese: Zhuge Liang, 181-234) from Sichuan, also referred to as Master 'Sleeping Dragon,' was a naturalist and 'teacher of the art of war for ten thousand generations.' Chinese warfare was weather-oriented, and Komei thus prayed at the altar of the Seven Sisters (the god of war) for a favorable wind form the southeast."